How much land is needed to power the world's major cities by solar? Asia tops the list for the continent that would need to designate the largest space to power its biggest cities by solar. Cities in Asia place in at seven different spaces in the top 10, where the largest amount of space is required. Seattle is among 17 major North American cities whose "2030 District" is driving high-efficiency district energy systems to share and exchange energy and heat between building partners - saving energy, money and maintenance costs, and providing more reliable power. Solar Power International 2017 took place from September 10th to 13th in Las Vegas, Nevada. This AltEnergyMag.com Special Tradeshow report aims to bring you news, articles and products from this years events. 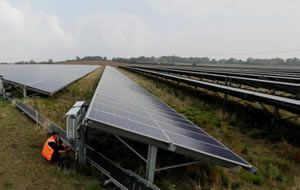 Reuters: "The cost of solar panels and batteries has fallen dramatically over the past few years, and this first subsidy-free development at Clayhill is a significant moment for clean energy in the UK," Claire Perry, minister for Climate Change and Industry said. Solar FlexRack TDP™ Turnkey Trackers are the next generation, single-axis solar tracker solution, complete with comprehensive services and support. What sets this tracking solution apart is its updated tracking technology bundled with a full suite of best-in-class project services and support for commercial and utility-scale solar customers. The TDP Turnkey Tracker offers the lowest total cost solution by providing the only tracker in the industry that includes full design, installation, commissioning, and support services bundled in one contract. Solar FlexRack's TDP Solar Tracker solution is supported by an in-house team of experts that includes mechanical, structural, civil, electrical and geotechnical engineers and geologists. 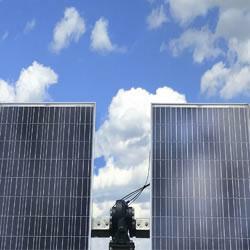 To learn more about Solar FlexRack's TDP Turnkey Tracker, one of the most cost-effective and comprehensive tracker solutions available, please visit: http://solarflexrack.com/products/tracker.